2017 Nationals take place September 9-10, September 16-17, and October 14-15 in 73 countries. Make it to the finals of Nationals, and earn a spot on your country’s team in the 2017 World Magic Cup! Your path to the global Magic stage—and your chance to play alongside your fellow countrymen for fame, fortune, and national pride—starts here with the 2017 Nationals! Each of the 73 countries that will compete in the 2017 World Magic Cup will run one Nationals to determine who will join their top Pro Point earner from the 2016-17 season on their national team. The finalists from each Nationals will represent their country on the national team at the 2017 World Magic Cup, which takes place December 1-3, 2017 in Nice, France. The winner of Nationals will be crowned their country’s national champion. Each country's 2017 Nationals are open only to those qualified players who are citizens or have been residents of that country since January 1, 2016. Complete information can be found in the Magic: The Gathering Premier Event Invitation Policy (Section 4). If you are planning to participate in an upcoming Nationals tournament, your first step should be to verify that you are listed under the correct nationality. To do this, just sign into the Planeswalker Points website by clicking on the Sign In button in the upper right corner of the page and entering your Wizards Account login ID and password. If your nationality needs to be corrected, please fill in an appeal immediately using the form here (You have to be logged into the Planeswalker Points site with your DCI number and password to access this form). Nationality-related appeals will be given high priority during the season. 2017 Nationals are invitation-only tournaments. These Premier Events will be held in countries that have been selected to have national teams compete at the 2017 World Magic Cup. The list of selected countries can be viewed in Appendix C of the Premier Event Invitation Policy. Players in the Planeswalker Points 2017 Yearly Award Points Season that have accrued the minimum amount of points for that country. The number of points required for each country can be found in Appendix C of the Premier Event Invitation Policy. Players from that country with Pro Tour Players Club Silver, Gold, or Platinum level (as of the date of their respective Nationals). Players (from that country) that are members of the Pro Tour Hall of Fame. Winners of Nationals Last Chance Qualifier tournaments. Most Nationals will be preceded by a Last Chance Qualifiers as well as Last Chance Trials. Each Nationals organizer may run up to ten of each of these events. Last Chance Qualifiers will award invitations to compete in that respective Nationals to the winner. Players who are not already qualified for Nationals may compete in one. Last Chance Trials will award a one-round bye in all one-day Nationals, and a two-round bye in all two- or three-day Nationals. Players who are not qualified to compete in Nationals cannot play in a Trial. Both events will be held the day before each Nationals. Contact the organizer of the Nationals you plan to attend to get a specific date, time, and cost of both the Last Chance Qualifier and Last Chance Trial. Complete details on Last Chance Qualifiers can be found in the Magic Premier Event Invitation Policy. Some Nationals may be two- or three-day events. For Two-day events, the Swiss rounds will take place on Saturday and Sunday, and the Top 8 playoff will also take place on Sunday. For three-day events, the Swiss rounds will take place on Friday and Saturday, and the Top 8 playoff will take place on Sunday. Events that will be multi-day tournaments will be announced in advance and reflected on the schedule. Events that are two-day tournaments, once announced as a multi-day event, will not reverse to a one-day event. The same goes for three-day tournaments which, once announced as such, will not revert to a two-day or one-day event. For full information, including which events will be multi-day tournaments, check with your local tournament organizer. 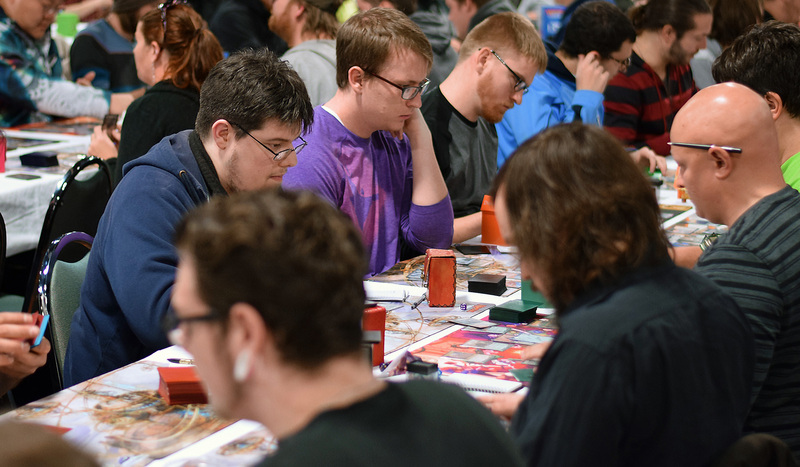 Players receive a number of byes at Nationals based on the Pro Tour Players Club membership level of the player (as of the date of Nationals), membership in the Pro Tour Hall of Fame, or by reaching the appropriate yearly Planeswalker Point threshold. Each Nationals will be a mixture of Standard and Booster Draft using the latest set for the draft rounds. Swiss rounds will each be 50 minutes in length. The top players after the final Swiss round will advance to the single-elimination playoff. The number of players that advanced to the playoff is based on the number of players in the event. The two semifinalists that lose their match will compete in a playoff match to determine who finishes in 3rd place for their respective Nationals. Entry fee varies from location to location. Check with local organizer for specific information. 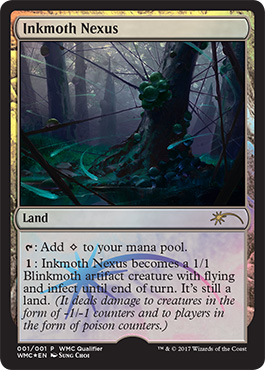 Each participant in 2017 Nationals will receive an alternate-art Inkmoth Nexus promotional card (while supplies last). The Top 8 finishing players will each receive an exclusive Nationals Top 8 playmat. Nationals awards Pro Points to the Top 4 competitors. 1st and 2nd place will receive 3 Pro Points. 3rd and 4th place will receive 1 Pro Point. The finalists of each event will receive an invitation and a travel award to compete on their country's national team at the 2017 World Magic Cup. The winner will be crowned their country's national champion.